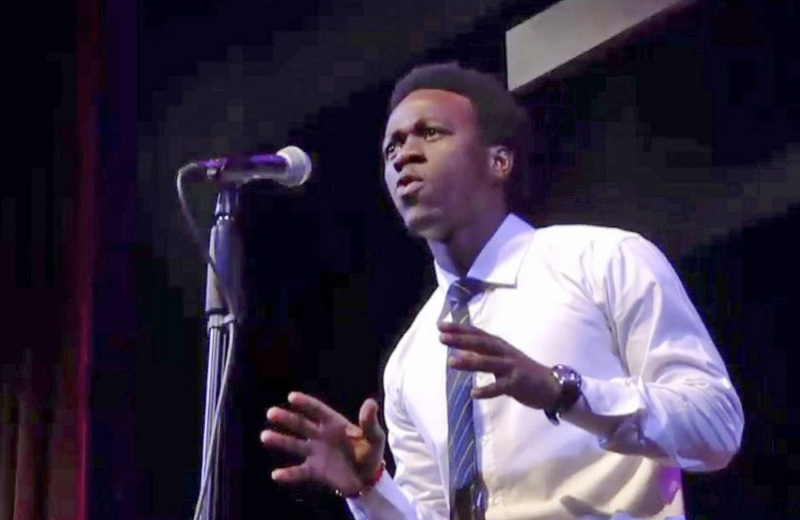 Allan Monga, an asylum seeker from Zambia, was not among the top 8 scorers in his semifinal round of the Poetry Out Loud competition. Allan Monga, a Deering High School junior, performs during a recent Poetry Out Loud competition. Some poems celebrate the triumphs of the human spirit while others lament the setbacks life can bring. Maine’s Allan Monga got a taste of both this past week. After winning a legal fight to participate in the Poetry Out Loud recital competition, the high school junior took the stage Tuesday but failed to advance past the opening round. Monga, a student at Deering High School in Portland, recited two poems at the national contest in Washington, D.C. Speaking shortly after competing Tuesday, Monga said he was proud of both his performance and his fight to break down barriers. Monga did not learn he could participate in the national contest until Friday, when U.S. District Judge John Woodcock granted a temporary restraining order against the National Endowment for the Arts. The NEA runs the contest and had barred Monga because he is neither a citizen nor a permanent resident, as contest rules require. Monga and the Portland schools filed a lawsuit against the NEA in April. In granting the temporary restraining order, Woodcock cited Monga’s right to a public education. He also cited the “irreparable harm” that would be done Monga if he missed out on a “one-time opportunity he has earned.” Monga won the Maine Poetry Out Loud contest, and state winners advance to the nationals. Monga flew to Washington on Monday with Deering English teacher Margaret Callaghan, who has been coaching him. Callaghan said she was disappointed that Monga didn’t advance and felt he deserved to. She said Monga’s “powerful” recitation style didn’t seem to be what the judges were looking for, as most of the students who advanced were more subdued. “All of the others were really talented. You can’t get to a national competition unless you’re really good, but I think he performed superbly,” said Callaghan. “He was as good as he always is.” Callaghan said that teachers and poets who have worked with Monga had considered asking him to tone down his powerful style, but decided that his talent was special and that they should not tinker with it. Callaghan said that she and Monga have been approached by teachers and students from other states who had heard of his legal fight. “People said they were impressed with the fight he has gone through and that they supported him,” said Callaghan. Monga competed Tuesday in the Region 1 semifinals against 17 other students from the Northeast and South. The semifinals of Poetry Out Loud were held all day Tuesday, with a total of nine students moving on to the Poetry Out Loud finals Wednesday night at George Washington University. Monga and Callaghan will stay in Washington through Wednesday to watch the finals. Monga is scheduled to meet with U.S. Rep. Chellie Pingree, D-1st District, and tour Capitol Hill. Pingree sent a letter to the NEA urging it to allow Monga’s participation. Also with Monga in Washington are representatives of the Maine Arts Commission, which runs the Maine Poetry Out Loud contest. The commission allowed Monga to participate in the state contest despite the national rules prohibiting students who are not citizens or permanent residents. When asked if he’d try again next year to reach the Poetry Out Loud national competition, Monga said he’d rather give another student from Deering a shot. “I would want to see someone else get the opportunity, and I would definitely like to help them,” Monga said. His second poem was the love poem “She Walks in Beauty” by Lord Byron. Monga donned a blue suit jacket for the poem, and used shrugs of his shoulders and nods of his head to punctuate the sentences. He has said the love poem reminds him of his mother. When introducing Monga on Tuesday morning, Poetry Out Loud host Felicia Curry made no mention of his lawsuit. Her brief description of Monga included the fact that his latest “literary crush” is author Tim O’Brien, and that if he could invent anything, it would be a time machine to travel to the future and the past. Monga flew alone to Maine from Zambia last year and spent time living at the Preble Street Teen Center in Portland. Monga had never recited poetry before being told about Poetry Out Loud by Deering teachers last fall. He soon discovered a passion for it, and found it gave him a voice to express himself. The winner of the national Poetry Out Loud contest gets $20,000, and finalists get smaller awards. State winners usually get paid trips to the national contest. But since the NEA was contesting Monga’s eligibility, money for Monga’s trip to Washington was raised by staff at the law firm Drummond Woodsum. The Portland firm is handling Monga’s legal battle at no cost. The suit filed on Monga’s behalf did not end with the temporary restraining order that allowed him to attend Poetry Out Loud. Monga’s attorney, Bruce Smith, said issues still to be resolved include whether the NEA will pay for Monga’s trip to Washington and whether the NEA can retain rules that bar certain classes of immigrants from the contest. Monga had not said why he left Zambia, only that he fled the country alone last year and has formally applied for asylum. Asylum cases are confidential, because they involve people fleeing from harm or the threat of harm. Talking about the reasons someone left his or her home country and fears the home government can be dangerous for friends and family left behind, asylum law experts say. Asylum seekers are allowed to stay in the U.S. until their cases are resolved.